Lydia loves Disney princesses and has always wanted to have her very own princess themed room of her own. Kids Wish Network granted Lydia’s wish and planned a day of princess pampering as well as a bunch of other fun surprises. Young Lydia started her wish at JC Penney’s Salon where she received a fabulous makeover to make her look like a true princess. Lydia loved the salon and really connected with her hairstylist Mrs. Winter. While Lydia was getting dolled up her dad stayed home to welcome the movers from both Legacy Furniture and Ashley Homestore while they brought in and set up Lydia’s new princess furniture. Lydia has endured six years of medical complications including hearing loss and a battle with retinoblastoma a type of cancer that has caused Lydia to go mostly blind in her left eye. While her cancer seems to be in remission she is still under observation for any additional tumors and has to endure daily complications as a result of her cancer. Before heading home for her big surprise Lydia dressed up as Sleeping Beauty, tiara and all. 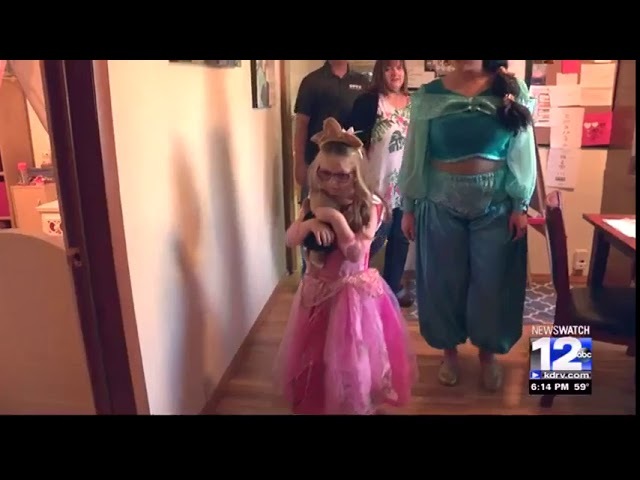 When Lydia and her mom pulled in their driveway they were greeted by Lydia’s favorite Disney Princess Jasmine and a whole news crew waiting to document her special day. When Lydia saw her new room she was speechless. Included in her new furniture was a new dresser and mirror combo, a nightstand, a toybox and a beautiful four-post canopy bed adorned with pink and white rainbows. To match the bed Cloud 9 Designs made a customized princess quilt just for Lydia. In addition to all her new furniture Lydia received a porcelain Sleeping Beauty doll that she could hardly put down. But the surprises weren’t over just yet, Lydia also received a gift bag from Ashley Homestore filled with miniature Disney princesses, a mermaid tail blanket and even two tickets to attend The Nutcracker ballet at the Craterian Theater where, coincidentally, Lydia takes ballet classes. Lydia truly felt like a princess during her wish and now she has a bedroom that she can truly call her own. “She just wants to play in her room now,” said Lydia’s mother Andrea. Check out Lydia in the news! !